Wide contoured seats keep you and your guests comfortable no matter how long the game last. Lifetime chairs are designed with extra tall, slightly reclining backs which are contoured for amazing back support as well. 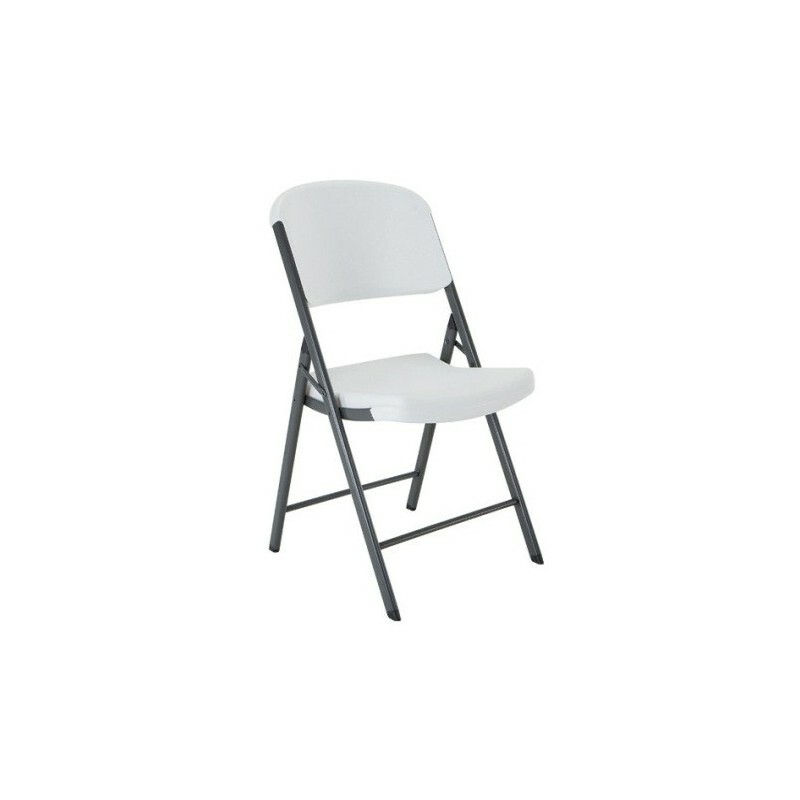 Many people say our Lifetime folding chairs are even more comfortable than a padded chair! If you find this item cheaper elsewhere (price plus shipping and taxes), please fill out our Pricematch Form. *We do not price match past orders, local stores, club or warehouses and the item must be in stock. *We reserve the right to deny any price match that we would incur a loss on. Do you often find yourself short on seating accommodations? 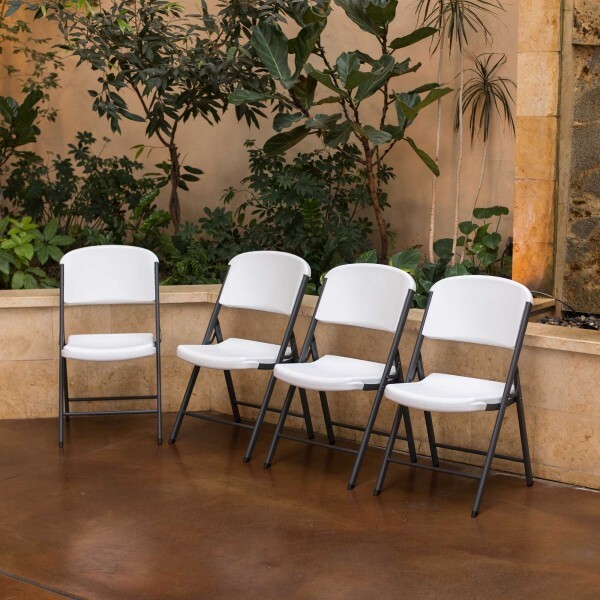 With Lifetime’s folding card table chairs, you can seat all your guests in comfort and style for many years to come. The wide seats and tall backs of these card table chairs provide superior support and comfort for those all night poker games or hours of Monopoly fun. 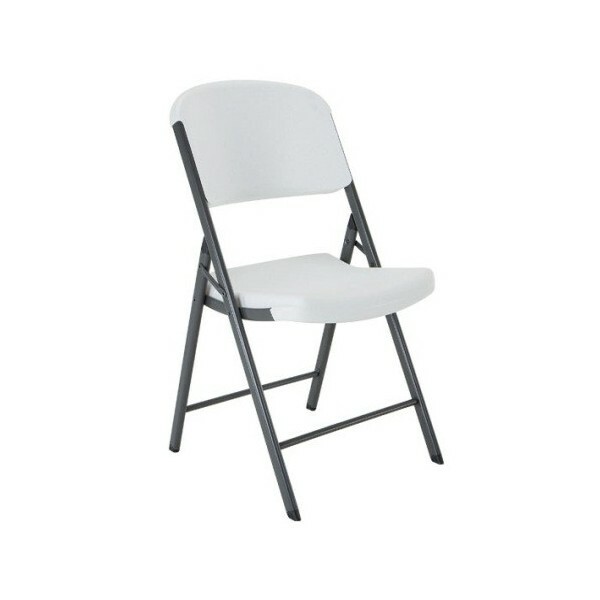 Lifetime’s attractive folding card table chairs are designed for indoor and outdoor use. The patented high-density polyethylene (HDPE) plastic and powder-coated frame assures weather resistance to rusting, chipping, or cracking. For comfortable accommodations in your family room or on the patio, these card table chairs are a great investment that will last for many years to come. Made in the USA. These Lifetime folding card table chairs are designed to fit the contours of your body. Wide contoured seats keep you and your guests comfortable no matter how long the game last. Lifetime chairs are designed with extra tall, slightly reclining backs which are contoured for amazing back support as well. 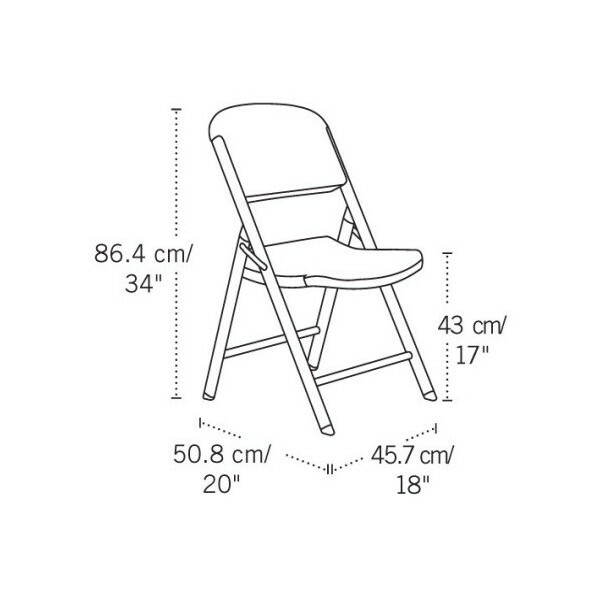 Many people say our Lifetime folding chairs are even more comfortable than a padded chair! Lifetime card table chairs are manufactured from high-density polyethylene plastic (HDPE) and steel to make them lightweight and durable. 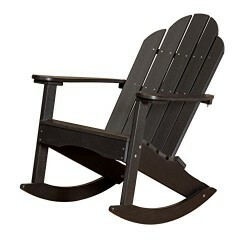 Much easier to maintain than wood or metal chairs because they are scratch resistant, stain resistant, and won't dent. Weather protected for outdoor as well as indoor use. UV inhibitors prevent the plastic from fading and warping, and powder-coated steel frame resists rusting. Made in U.S. 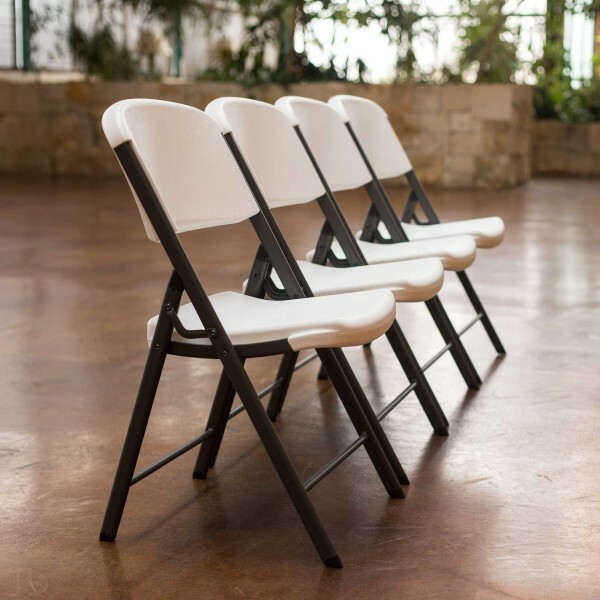 The steel oval tubing we use in our folding chairs provides 20% more strength than the round tubing you often find with other folding chairs on the market. Steel cross-brace is welded between the legs of the chair for added strength and stability. Superior strength frame allows a maximum weight capacity of 500 lbs. 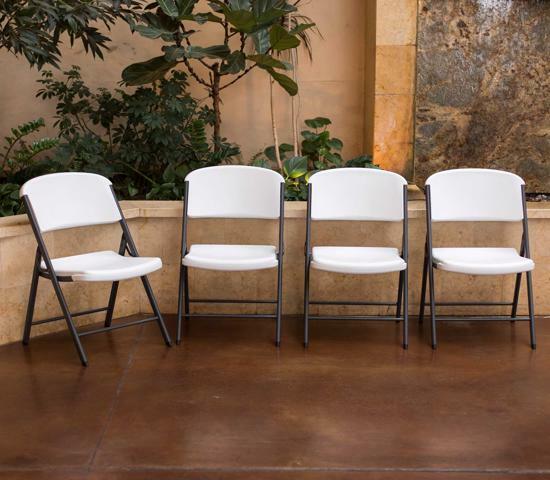 These folding card table chairs are perfect for family game nights because they're so easy to clean and maintain. Spills, greasy crumbs and sticky fingers are not a problem! The polyethylene plastic surfaces of these chairs are water proof, stain resistant, and scratch proof. Mild soap and water are all it takes to keep them looking as good as new throughout many years of family fun. The Business and Institutional Furniture Manufacturer's Association (BIFMA) sets industry standards for commercial-grade furniture. The standards are intended to provide manufacturers and users with a common basis for evaluating safety, durability, and the structural adequacy of the specified furniture. The standards define specific tests, laboratory equipment to be used, formulas to determine weight or height to use in each test, the conditions of testing, and the acceptance levels to be used in evaluating these products. 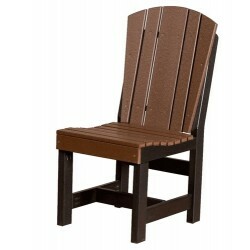 Contoured for Comfort: Chair back and seat are contoured to your shape for maximum comfort. High Strength Low Alloy (HSLA) Steel: Chair is lighter with even more strength and increased performance making it easy to carry and more durable. Non-Marring Foot Caps: Durable caps prevent floor damage. Strong Tubing: Frame is powder-coated and uses durable steel tubing. Superior Cross-Brace Weld: Cross brace inserted into tubing and welded at two points for added durability and strength. Maintenance: Easy to clean. Use mild soap and a soft-bristled brush. For tough stains, use a mild abrasive such as Soft Scrub. Use rubbing alcohol on wax, and a de-greaser for automotive grease. 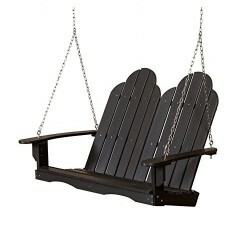 Swing your worries away on the Little Cottage Company swing! 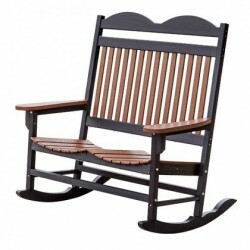 Little Cottage Co. Heritage Traditional Double Rocking Chair Poly Furniture enjoy the traditional look of an Traditional Amish Rocking Chair with a double seat that is constructed of Poly Lumber a unique advantage over traditional wood. Two Seat Patio Fan-Back Glider Poly Lumber Furniture - Little Cottage Co. placing this Two Seat Patio Fan-Back Glider on the porch, poolside, or simply under shaded tree will allow you to relax and enjoy the day. This single glider will never require painting or sealing, simply use soap and water for occasional cleaning. Our Poly Lumber is extruded from virgin and recycled recyclable plastics and includes a UV stabilizer preventing fading and discoloring. 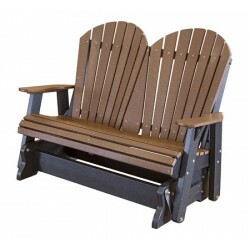 Double Rock-a-Tee Fan-Back Glider Chairs Poly Lumber Furniture - Little Cottage Co. Boasting Durability and a smooth glide this double rock-a-tee will keep you comfortable for years to come! made with blends of virgin and/or recycled plastics. 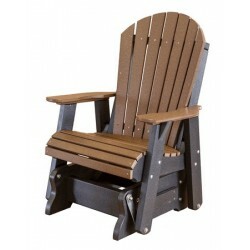 Adirondack Chair Fan-Back Poly Furniture - Little Cottage Co. From an ocean breeze to a mountain view this adirondack chair will provide your patio with the seating it needs! Classic 49" Bench Glider Poly Lumber Furniture - Little Cottage Co. The Classic Glider is sure to leave an impression with the classic style and comfort it offers. 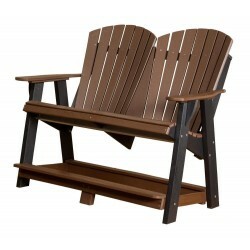 The glider is the perfect addition to any outdoor setting! Little Cottage Co. Heritage High Adirondack Chair Poly Furniture We added some flair to our durable high chair, by designing this unique Heritage High Adirondack Chair! 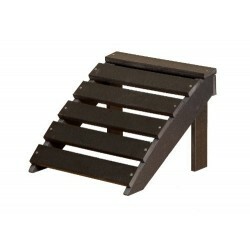 Heritage Folding Footrest Poly Lumber Furniture - Little Cottage Co. Prop your feet up with our folding Footrest that offers the same great quality as all of our furniture! 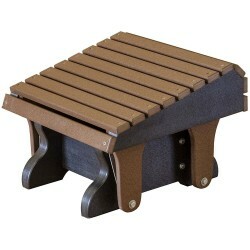 Heritage Gliding Footrest Poly Lumber Furniture - Little Cottage Co. Our gliding footrest is great with our single rock-a-tee set and boasts the same smooth and durable glide! 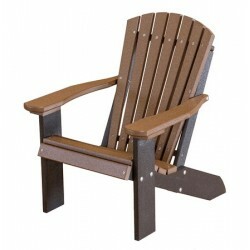 Heritage Garden Chair with Armrest Poly Furniture - Little Cottage Co. when creating this garden chair. We decided to use stainless steel fasteners and HDPE Poly Lumber that maintains its color throughout the chair, if scratched or dented. 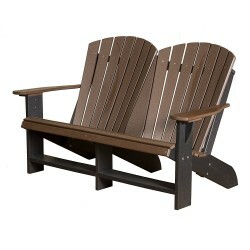 Little Cottage Co. Heritage Traditional Double Adirondack Chair Poly Lumber enjoy the classic look of a traditional double chair without the worry of splintering or hot metals from the scorching sun. 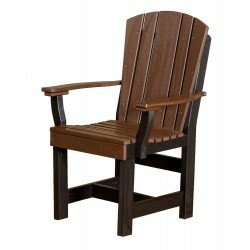 Little Cottage Co. Heritage High Adirondack Chair Poly Lumber enjoy the days and evenings away in this traditional style. 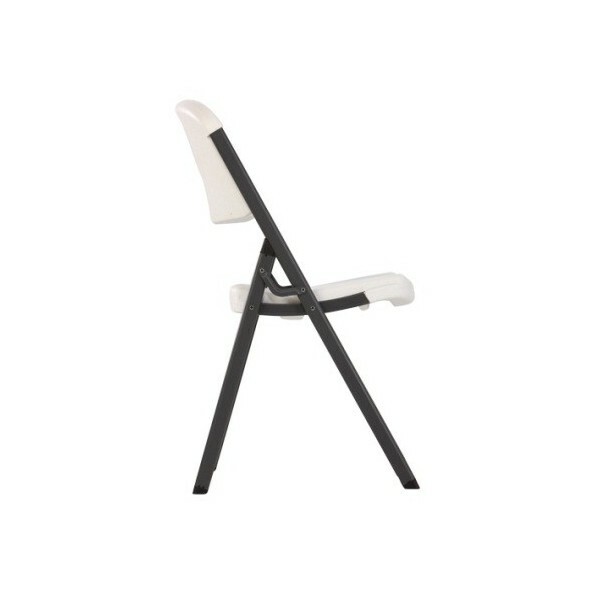 Unlike most rockers this heritage high chair stands a little higher than your average chair making it more comfortable and easier to get out of. Little Cottage Co. Heritage Dining Chair Poly Furniture are designed to be placed with the heritage dining table series either LCC-189, LCC -191. Little Cottage Co. Heritage Dining Chair with Armrest Poly Furniture are designed to be placed with the heritage dining table series either LCC-189, LCC -191. Placing our chairs at the dining table adds comfort and style to the heritage armrest dining chair. FREE Fast Shipping! 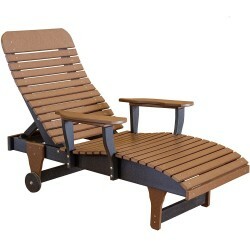 Little Cottage Co. Heritage Chaise Lounge Poly Lumber Furniture Our Poly Lumber Furniture is fade resistant, making this chaise lounge perfect for your summer sun bathing by the pool! 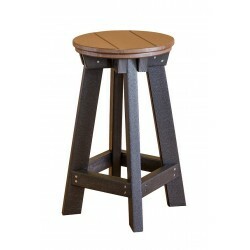 Outdoor Poly Lumber Furniture Bar Stools - Little Cottage Co. Our Bar stools are a durable choice for your BBQ area! If you're building an outdoor bar area and worried about bringing in storage your patio furniture, you can rest assure that these Poly Lumber bar stools can remain outdoors without any worry. 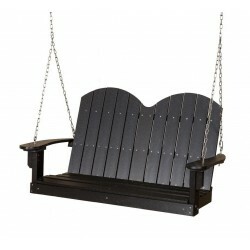 Little Cottage Co. Porch Swing Classic 49" Poly Lumber The Classic Swing is our customers favorite swing! 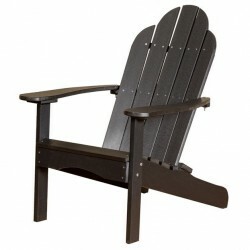 This model is a great choice when looking for a relaxing way to enjoy the outdoors! Classic Savanna 52" Porch Swing Poly Lumber - Little Cottage Co. The Classic Savannah Swing brings a statement style and comfort to your front porch, deck, or patio setting! Classic Adirondack 48" Porch Swing Poly Lumber - Little Cottage Co. 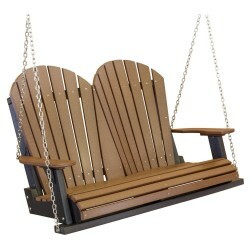 The Classic Adirondack Swing is a great way to take comfort outdoors! Little Cottage Classic Mission 48" Porch Swing Poly Lumber - Little Cottage Co. 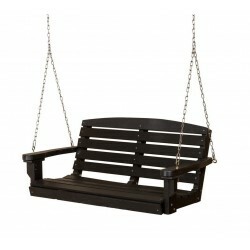 The Classic Mission Swing adds a bold look to your outdoor setting. 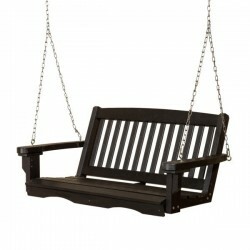 Both functional and aesthetically inclined, this swing is the perfect piece for any outdoor setting! 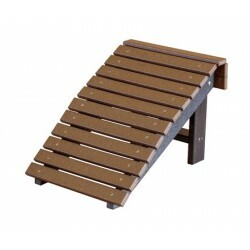 Little Cottage Classic Mission 48" Bench Glider Poly Lumber - Little Cottage Co. The Classic Mission Glider creates the perfect opportunity for enjoying peaceful moments outdoors! 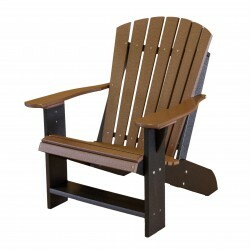 Classic Adirondack Chair Poly Furniture - Little Cottage Co. enjoy the outdoors by relaxing in our Classic Adirondack Chair Poly Furniture constructed of durable HDPE resin and a color process that allows the color to stay consistent throughout the poly lumber your furniture will never fade or change color. 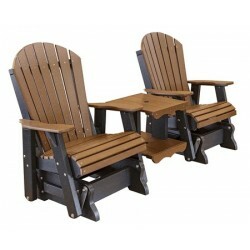 Classic Adirondack Double Glider Chair Lumber Furniture - Little Cottage Co. 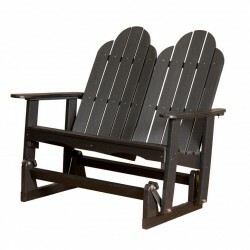 The Classic Adirondack Double Glider Glider features our customer favorite design combining extreme comfort and classic design! 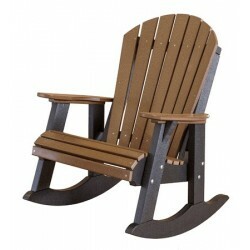 Patio Classic Adirondack Rocker Chair Poly Lumber Furniture - Little Cottage Co. 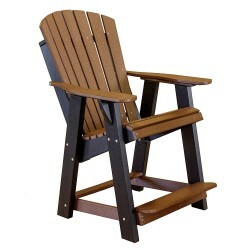 The Classic Adirondack Chair is named by our customers as the most comfortable Adirondack Rocker Chair! designed and built by Amish quality craftsmanship with poly lumber that will sub stain any dents or scratches and will not change color. Little Cottage Co. Classic Footrest Poly Lumber Furniture is the perfect touch to any outdoor set, especially when added with a piece from our Classic Collection! 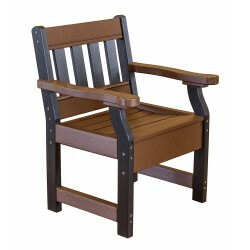 Made with high quality poly lumber that can be left outdoors without any worries of cracking or fading. 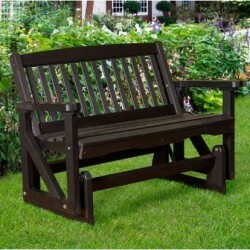 Classic 47" Vineyard Bench Poly Lumber Furniture - Little Cottage Co. 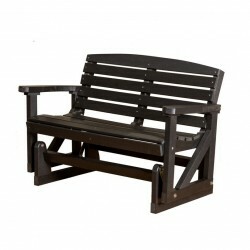 The Classic Vineyard Bench accents any garden area or outdoor entertaining area perfectly! 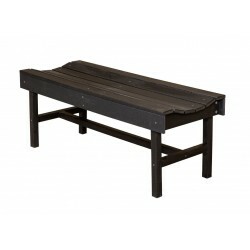 Enjoy the outdoors by placing this wine yard bench on your deck, patio or yard. 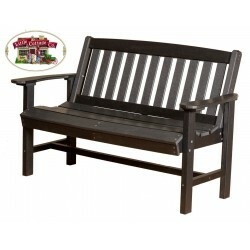 Classic Mission 56" Bench Poly Lumber Furniture - Little Cottage Co. The Classic Mission Bench makes quite the statement! Offering both comfort and style, this bench is sure to be a crowd pleaser!